The Department of Jurisprudence was founded at Berkeley in 1894. In 1912, the department was renamed the School of Jurisprudence, it was again renamed as the School of Law in 1950. The School was originally located in the center of the main UC Berkeley campus in Boalt Memorial Hall of Law, which was built in 1911 partially with funds from Elizabeth Josselyn Boalt donated in memory of her late husband, John Henry Boalt, an attorney who had resided in Oakland, California until his death in 1901. In 1951, the School moved to its current location in the new law building, the instructional portion of which was named Boalt Hall, at the southeast corner of the campus, and the old Boalt Hall was renamed Durant Hall. 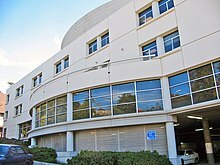 In April 2008, the law school rebranded itself through a change of name from "Boalt Hall" to "Berkeley Law" to tie the law school's name more closely with the campus upon which it resides. The administration hoped that this would improve the law school's national and international name recognition since people already know of UC Berkeley and that it has a law school but are often confused by the use of 'Boalt Hall'. Boalt Hall's law library was expanded in 1996 with the North Addition, pictured above. Berkeley Law has approximately 850 J.D. students, 200 students in the LL.M. and J.S.D. programs, and 45 students in the Ph.D. program in Jurisprudence and Social Policy. The School also features specialized curricular programs in Business, Law and Economics, Comparative Legal Studies, Environmental Law, International Legal Studies, Law and Technology, and Social Justice. The J.D. program's admissions process is highly selective. Berkeley Law is known to value high undergraduate GPAs. Consequently, Berkeley has the 9th highest 75th percentile GPA. According to U.S. News and World Report, Berkeley has the 12th lowest acceptance rate among U.S. law schools, with about 25% of applicants admitted. For the class entering in the fall of 2017, 1,266 out of 5,466 applicants (23.1%) were offered admission, with 303 matriculating. The 25th and 75th Law School Admission Test (LSAT) percentiles for the 2017 entering class were 164 and 168, respectively, with a median of 166. The 25th and 75th undergraduate GPA percentiles were 3.66 and 3.88, respectively, with a median of 3.79. Berkeley Law's grading system for the J.D. program is unusual among law schools but similar to the grading system used at Yale Law School. Students are graded on a High Honors (HH), Honors (H), and Pass (P) scale. Approximately 60% of the students in each class receive a grade of Pass, 30% receive a grade of Honors, and the highest 10% receive a grade of High Honors; lower grades of Substandard Pass (or Pass Conditional, abbreviated PC) and No Credit (NC) may be awarded at the discretion of professors. The top student in each class or section receives the Jurisprudence Award, while the second-place student receives the Prosser Prize. For a typical class in the J.D. program, the average age of admitted students is 24 years old, over a range of ages from 20 to 48 years old. Berkeley Law's tuition has increased in recent years. Currently, tuition and fees are $49,364 per year (in-state) and $53,315 per year (out-of-state). Most out-of-state students may claim in-state status in their second year of study. The faculty of Berkeley Law also provide academic direction and the bulk of the instruction for the undergraduate program in Legal Studies, which is organized as a major in Letters and Science. The Legal Studies program is not intended as a pre-law program, but rather as a liberal arts program "that can encourage sustained reflection on fundamental values." Berkeley Law has a chapter of the Order of the Coif, a national law school honorary society founded for the purposes of encouraging legal scholarship and advancing the ethical standards of the legal profession. It is an American Bar Association approved law school since 1923. It joined the Association of American Law Schools (AALS) in 1912. Berkeley Law offers combined degree programs with other schools at the University of California, as well as MA degrees from Tufts University and Harvard University. In 2018, QS World Rankings ranked Berkeley Law as the 7th best law school in the world. Law.com ranked Berkeley as one of the top 10 go-to law schools.. In 2019, U.S. News & World Report ranked Berkeley Law as the 10th best law school in the United States, tied with Duke and Northwestern. US News & World Report also ranked Berkeley Law as the best law school in the U.S. for intellectual property, the 3rd best for environmental law, and the 10th best for international law. Moreover, US News & World Report ranked Berkeley Law's clinical training program as 10th best in the U.S.
Berkeley Law's flagship law review, the California Law Review, is ranked 7th in the U.S. According to Brian Leiter's 2012 scholarly impact study, Berkeley Law ranks 7th in terms of scholarly impact as measured by the percentage of tenured faculty represented in specific specialty areas. In 2010, Law and Politics "Super Lawyers" magazine ranked Berkeley as 9th in the country, just above Yale Law based on the number of Super Lawyers it produces. 890 alumni are in their list of the top 5% of peer rated attorneys for 2009. In July 2018, Berkeley Law's bar passage rate was 86 percent, the second-best in California. According to Berkeley's official ABA-required disclosures, 95.76 percent of 2016 graduates obtained full-time, long-term, bar admission-required employment nine months after graduation, and 1.21 percent were enrolled in a full-time degree program. The total cost of attendance (indicating the cost of tuition, fees, and living expenses) at Berkeley Law for the 2018-2019 academic year is $85,315 for California residents and $89,266 for non-residents. The Law School Transparency estimated debt-financed cost of attendance for three years is $282,442 for residents and $296,694 for non-residents. A view of San Francisco and the Bay from Boalt Hall. Walter Gordon, 1922 — first All-American at UC Berkeley, first African American graduate of Boalt Hall, Governor of the United States Virgin Islands, Federal District Judge. Senior Chief Judge Lloyd D. George, 1961 — Federal judge on the United States District Court for the District of Nevada in the U.S. Courts. William B. Shubb, 1963 — Senior Chief Judge of the Eastern District of California in the United States Court of Appeals for the Ninth Circuit of the U.S. Courts. Lawrence R. Leavitt, 1969 — Magistrate Judge in the District of Nevada, a division of the United States Court of Appeals for the Ninth Circuit of the U.S. Courts system. Zoë Baird, 1977 — Bill Clinton's first unsuccessful nominee for attorney general in 1993. Noura Erakat — Palestinian American legal scholar, human rights attorney, and assistant professor at New Century College, George Mason University. Christopher Edley, Jr. — Dean of Boalt Hall (2004–); co-founder of The Civil Rights Project formerly at Harvard University. Herma Hill Kay — former Dean of the School of Law (1992–2000); Prominent leader in establishing no fault divorce laws. Goodwin Liu — Constitutional law professor, associate dean, and former unsuccessful nominee to the United States Court of Appeals for the Ninth Circuit. Associate Justice, California Supreme Court (2011–present). Eleanor Swift — led the establishment of Boalt's Center for Clinical Education, which brings clients in need of legal advice to Boalt, where students and faculty provide counsel. John Yoo — former deputy assistant Attorney General and author of controversial (and subsequently withdrawn) Justice Department memoranda relating to Presidential wartime authority. Sandy Cohen, a character on the popular television series The O.C., is a lawyer and a Boalt Hall alumnus. "The O.C. at Boalt" is a student group that, in addition to screening episodes of The O.C. during the lunch period, offers the Sandy Cohen Fellowship, a summer grant for students who plan to work as public defenders (on The O.C., Sandy Cohen worked as a public defender while living in Orange County). In recent years, "The O.C. at Boalt" has also managed to bring Peter Gallagher, the actor who plays Sandy Cohen, to Boalt to speak on an annual basis. Matthew Perry played a Republican graduate of Boalt Hall on multiple episodes of The West Wing. Kelly Rutherford played lawyer Samantha "Sonny" Liston, a graduate of Boalt Hall, on E-Ring. Joanie Caucus, a character in Garry Trudeau's comic strip Doonesbury, attended Boalt Hall. In Catch Me If You Can, Martin Sheen plays Roger Strong, the District Attorney of New Orleans and a Boalt Hall alumnus. Mike Daly, protagonist of the bestselling Mike Daley/Rosie Fernandez novels by Sheldon Siegel, is a Boalt Hall graduate and, together with his wife, taught there for about a year. In the movie Intolerable Cruelty, a copy of the California Law Review is featured prominently on a table in the senior partner's office. Judy Carrier, a major continuing character in Lisa Scottoline's novels about Rosato & Assoc. — an all-female law firm in Philadelphia, received her degree froam Boalt Hall and is a very bright legal scholar. Pete Harrison, played by Bradley Whitford, was the leading role in the hit show "Trophy Wife", and was a Berkeley Law graduate. He dons a Berkeley Law sweatshirt in the first season. ^ a b c d "Best Law Schools". U.S. News & World Report. ^ "U.S. News & World Report, Best Law Schools: University of California — Berkeley". Retrieved March 10, 2015. ^ "Annual Endowment Report, Fiscal Year Ended June 30, 2013; p.4" (PDF). Chief Investment Officer of the Regents of the University of California. Retrieved 2013-11-30. ^ "Roma Pacifica: John Galen Howard, Planting Scheme, West Elevation of California Hall, Boalt Hall, and Philosophy Building". Lib.berkeley.edu. Retrieved 28 September 2018. ^ "UC Berkeley dropping Boalt Hall from law school's official name". Sfgate.com. 10 October 2007. Retrieved 28 September 2018. ^ Tanya Schevitz, UC Berkeley dropping Boalt Hall from law school's official name, San Francisco Chronicle, October 11, 2007. ^ "Standard 509 Reports" (PDF). Law.berkeley.edu. Retrieved 28 September 2018. ^ "Fees & Cost of Attendance - Berkeley Law". Law.berkeley.edu. Retrieved 28 September 2018. ^ "UC Berkeley Legal Studies Web site". University of California, Berkeley. ^ Smith, Anesha. "member chart". Orderofthecoif.org. Retrieved 28 September 2018. ^ "ABA-Approved Law Schools by Year". ABA website. Retrieved April 20, 2011. ^ "Member Schools - Association of American Law Schools". Aals.org. Retrieved 28 September 2018. ^ "Law". Topuniversities.com. 22 February 2018. Retrieved 28 September 2018. ^ Zaretsky, Staci. "The Best Law Schools For Getting A Biglaw Job (2018)". Abovethelaw.com. Retrieved 28 September 2018. ^ "The 2018 Go-To Law Schools - Law.com". Law.com. Retrieved 28 September 2018. ^ "Best Law Schools Ranked in 2020". ^ "Law Journal Ranking, Spring 2018 – Bryce Clayton Newell". Bcnewell.com. Retrieved 28 September 2018. ^ "New Document". Leiterrankings.com. Retrieved 28 September 2018. ^ Top Law Schools: 2010 Super Lawyers U.S. Law School Rankings. Superlawyers.com. Retrieved on 2014-06-17. ^ Zaretsky, Staci. "A Breakdown Of California Bar Exam Results By Law School (July 2018)". Abovethelaw.com. Retrieved 18 April 2019. ^ "Fees & Cost of Attendance - Berkeley Law". Law.berkely.edu. Retrieved 18 April 2019. ^ "University of California - Berkeley, Finances". lstscorereports.com. Retrieved 18 April 2019. ^ Gordon, Walter; et al. (1976–1979). "An Interview With Walter Gordon". Athlete, Officer in Law Enforcement and Administration, Governor of the Virgin Islands: oral history transcript / Walter Gordon (Interview). 1–2. Interviewed by Anne Hus Brower; Caryn Prince; Rosemary Levenson; Amelia R. Fry. Berkeley, California: Bancroft Library. Regional Oral History Office. Retrieved 14 April 2010. ^ Grimes, William. "Stephen Barnett, a Leading Legal Scholar, Dies at 73", The New York Times, October 21, 2009. Accessed October 22, 2009. ^ "Biography of Professor Sho Sato". UC Berkeley School of Law. Retrieved 4 December 2013. ^ "Status of Certain OLC Opinions Issued in the Aftermath of the Terrorist Attacks of September 11, 2001" (PDF). United States Department of Justice Office of Legal Counsel. 2009-01-12. Retrieved 2009-03-02. ^ "Indian-origin scholar Sujit Choudhry becomes dean of top US law school". Patrika.com. 2 July 2014. Retrieved 3 July 2014.